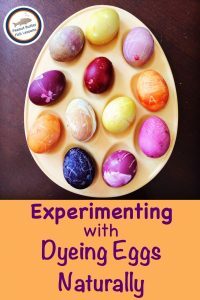 Last year, the kids and I explored dyeing eggs for Easter using different foods. 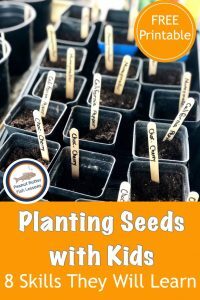 The results were amazing and we had so many opportunities to experiment with the process! 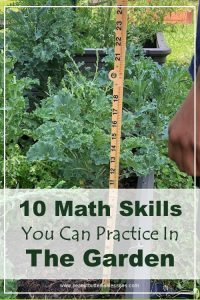 They were able to practice their math and science skills and have lots of fun at the same time. Here is the step-by-step process for dyeing the eggs and lots of ideas for how to ‘eggsperiment’ with the process! Make sure you print the FREE ‘Eggsperiment’ Notecards at the end. We made buying the supplies into a math lesson. We had a budget that we had to stay within to buy our eggs and foods for the dyes. Twenty dollars was our limit. This meant that we were not able to buy every type of food for the dyes. We had to see what we might already have at home. Once we got to the store, we had to play around with different combinations of supplies to see what would fit within our budget. This led to a lot mental math while at the store. My suggestion is to buy one carton of each and experiment with how the different eggs accept the dye. Have your children make a prediction (or a hypothesis!) as to what the white eggs may look like vs. the brown eggs after being dyed. Then, they can observe if their predictions were correct after the process is complete. Here are the best foods for dying eggs. I suggest picking three to four. You will need to boil most of them on the stove for 30 minutes so picking more than four can become cumbersome. Pink: 4 cups Beets (chopped) You could play around with different colored beets. You will also need about 8 Tbsp. of white vinegar. I keep a big jug on hand for cleaning so this did not factor into our budget for this project. 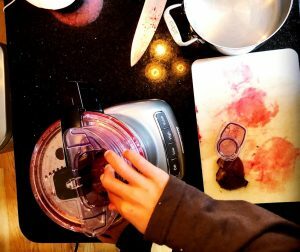 We used a food processor to chop our beets and cabbage..
You will want to leave up to 24 hours for the eggs to sit in the dyes so plan when you want to make your dyes accordingly. Step 1: Add 1 quart of water and 2 Tbsp. 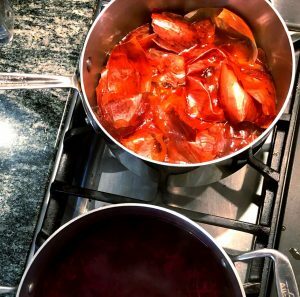 vinegar to a medium pot. Use a separate pot for each dye you are going to make. Step 2: Bring to a boil and then add your ingredients from above (except for blueberries- see below). Lower the heat and let simmer for 30 min. Step 3: Let cool and then strain the liquid into mason jars or similar containers. 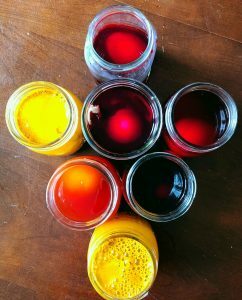 Since you may leave some eggs in the dye up to 24 hours, you may want multiple jars for each color or quart size jars to hold multiple eggs. Blueberries: Combine 4 cups each of water and frozen blueberries in a bowl. Once they come to room temperature, strain the liquid into jars. Place the eggs in the jars and refrigerate during the dyeing process. You can use white crayons to decorate your eggs before placing them in the dye. Drawing stripes, flowers, stars, crosses, your initials or any other designs you can think of is fun! If you are going to complete any of the ‘eggsperiments’ below, you may want to write a small number on the bottom of the egg to correspond to your notes about how you dyed that egg. It would also be interesting to take sand paper or an emery board and lightly file away some of the shell to see how that may change the dying process. Next, you will place the eggs in the different dyes. They will need to sit for up to 24 hours. Eggsperiment 1: Color of the original egg. Compare a brown and a white egg in the same dye. Eggsperiment 2: Time left in the dye. See how the eggs look at different points in the dyeing process. You could take eggs from a single color out at 6, 12, and 24 hours and compare the difference in the colors at each stage. Eggsperiment 3: Vary the temperature. Put some jars in the refrigerator and leave some at room temperature and see how the temperature affects the dyeing process. Eggsperiment 4: Layer the dye. Place the eggs in the dye for a few hours, remove them, dry them off and put them back in the same dye. Repeat this process a few times over several hours and see if these eggs look different than the ones just left in the dye for the same amount of time. Remember, you never want to change more than one variable at a time or you won’t know what caused the eggs to look different! 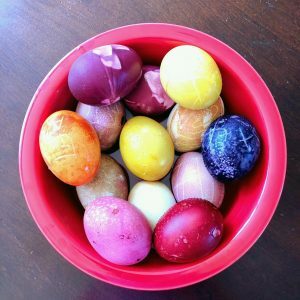 For example, if you want to see if refrigerating the eggs changes the color, make sure you pick the same color egg to begin with and place it in the same dye for the same amount of time. 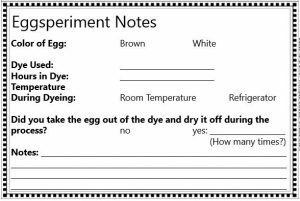 Make sure to make notes about each egg so that you can make accurate observations about your experiments! Here are FREE printable Eggsperiment Notecards to keep track of how you dyed each egg so you can compare them at the end. Hope your eggs turn out AMAZING! If you thought of any other experiments to do with the eggs, let us know below! If you want to know a little more about the history of using natural dyes, check out: A Brief History of Natural Dyes.